Chris Bumpus grew up in the Northeast where he attended college receiving his BS in General Biology from the University of New Hampshire, his MBA from the University of Rhode Island, and his Masters in Oceanography from the University of Rhode Island. After completing his Master’s degree he moved to Miami to continue his career in the field of fisheries as well as teach college courses in oceanography and environmental science. He joined the Deering Estate in the fall of 2016 and the Learning Programs Manager, leading the efforts to integrate science into the Deering Estate’s curriculum, create a suite of STEM+Arts curriculum, and expand nature based learning experiences for all ages. Eileen has lived in Miami for most of her life, moving with her parents and brothers from Cleveland, Ohio. She graduated from Florida Atlantic University in Boca Raton with a B. S. in Marketing. She has been the Deering Estate Business Manager since 2004. She manages budget and financial planning and reporting, cash handling, the RMS sales system, accounts payable/receivable and procurement. In addition to enjoying family time, her interests include reading, photography, travel and raising orchids. 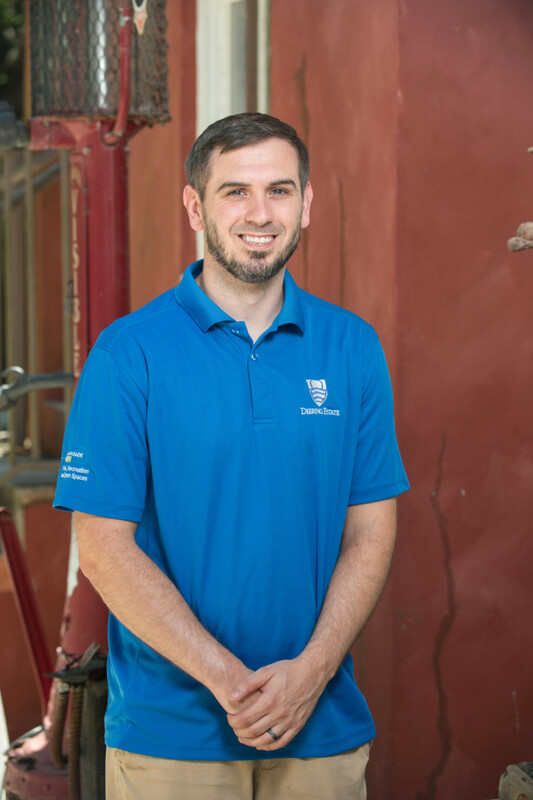 Andres currently serves as the Manager of Grounds and Maintenance. He has been with Deering Estate for over 20 years. In the past he has been recognized by Professional Grounds Management Society and Landscape Superintendent Magazine for his excellence in grounds skills, dedication and management. Melissa Diaz received her Master’s Degree in Art History from the University of South Florida where her area of concentration was the early works of Michelangelo Pistoletto and his involvement with Arte Povera. She has held positions in several museums and galleries throughout South Florida including the Institute of Contemporary Art Miami, David Castillo Gallery, and Miami Art Museum (now Pérez Art Museum Miami). Additionally, she participated in the Peggy Guggenheim Collection internship program in Venice, Italy, where she was the first recipient of the Liesbeth Bollen Internship Fund. As an independent curator, Melissa has organized several contemporary art exhibitions in South Florida. She has taught courses in art history and museum studies for Miami Dade College, Florida International University and New World School of the Arts. Bethany Gray moved to the Miami area in 2015 from Central Florida where she was the Curator of Collections for the Art & History Museums of Maitland. Bethany studied Art History and Archaeology at Rollins College in Winter Park where she held a museum fellowship and later became the Exhibits and Facilities coordinator at the Cornell Fine Arts Museum on the Rollins Campus. She did graduate work at Johns Hopkins University in the Museum Studies program. Bethany manages Historic Preservation work, capital projects, Grounds, Security and the Curatorial teams at the Deering Estate. She is a native of St. Louis, Missouri and enjoys photography, local history and genealogical research. Cathy graduated from Florida International University with a Master in Public Administration (MPA) Degree and a Bachelor of Arts Degree in English Literature. She also studied abroad at Charles University in Prague, Czech Republic. Cathy began her employment with Miami-Dade County in 2003 with the Department of Cultural Affairs. In 2006, she moved to the Department of Environmental Resources Management (DERM) and served as the Department’s Public Information Officer. In late 2006, Cathy joined the Deering Estate as the Marketing Manager. 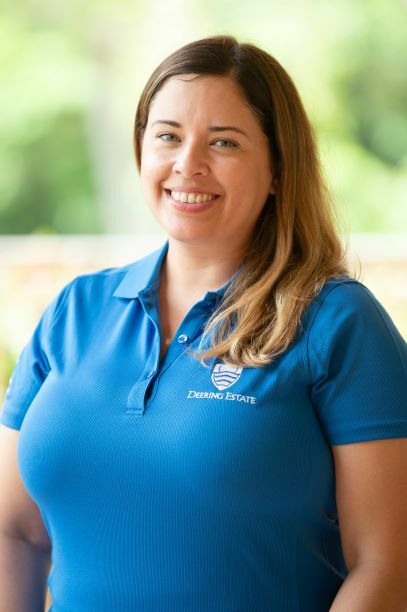 Rosana joined the Deering Estate in 2008 as a Guest Services Representative and was promoted to the Assistant to the Business Manager in 2013. She assists with daily and monthly attendance reports, daily sales system data, accounts payable system processing, creating purchase orders, monitoring of the online sales system and more. Jenna has a degree in Recreation and Leisure Services Administration. She started at Deering in 2009 as a summer camp counselor and continued as part of our Education Team. In 2011 she transferred to the Special Events department as the Special Events Manager. Karen Solms has a Master’s Degree in Marine Biology from NOVA Southeastern University and a Bachelor’s Degree in Zoology with a minor in Environmental Science from University of Florida. Karen began her career with Miami Dade County Parks, Recreation and Open Spaces Department in 2000 as the lead naturalist for the Sea Turtle Awareness Program at Crandon Park. Karen became the Visitor Services Manager for the Deering Estate in 2013.